Having now lost our last girl to a fox in broad daylight on our front garden we have come to the sad conclusion that they can no longer be completely free range round our farm. I have four chicks which we hatched from another lovely girl who the fox had. 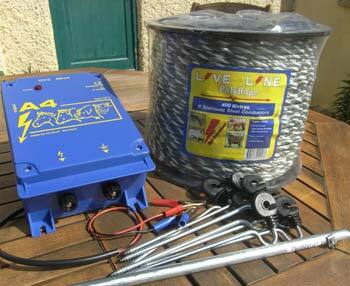 I wasn’t too sure about electric fencing, however, having read all the comments I am going to get some this weekend and hopefully that will keep them all safe until we sort the fox out. sorry for your loss. but it is are responsibility to keep the chickens safe, the fox will always try to find a way, he needs to feed like all animals. i keep chickens and i also love the fox. 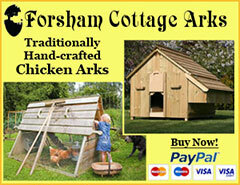 the fox will learn that he can’t get past your electric fence and your hens will be safe. I too have just lost another free range chook to the fox at 7am. We frightened it away with the sound of the gun (no time to load!) but my girl has gone. 4 nil to the fox. 2 girls left and one on the nest. I have a lot of horse electric fencing tape so will make their enclosure larger with that just need to buy an energiser & battery. how do you keep chickens in that fly to the top of the fence or over the fence? 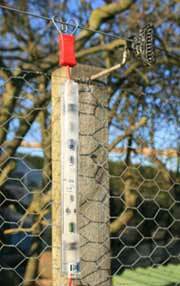 What happens if there is electric wire at the top of the fence and the chicken lands on it? 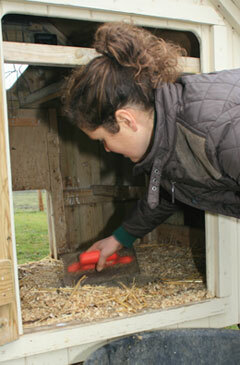 Chickens can have a wing clipped to stop them flying but some lighter breeds can be tricky to keep on the ground. Electric fences can keep chickens IN as well as predators OUT. Commercial free range producers often have 12 or so electric wires that do this and electric poultry netting does this too. It takes quite a powerful energiser to give them a shock through the layers of feathers but once touched, they learn not to touch it again. But if the chicken isn’t touching the ground how can it get a shock? You are correct, they only get a shock if they make contact with the live wire and the ground. I am in the process of erecting electric poultry mesh. We have a 50 m length but do not require the total length at this time. We have about 5 m in excess of our needs. Can we roll that up and what happens when the live wires in the mesh touch? That should be fine. When the wires touch, nothing should happen because they are all at the same voltage. What you must do is make sure these wires don’t touch the ground. That is when there is a difference in voltage and you’ll get a spark / short circuit. I have a 4 foot chain link fence that my chickens hop onto then out of the yard. Is there a kind of electric fencing I can install on top of the fence to keep them from leaving my yard? 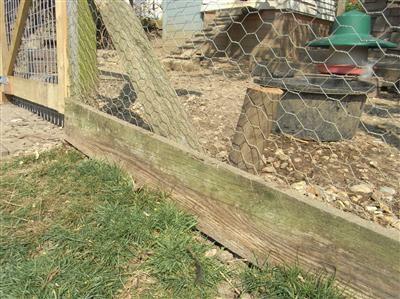 You would need to install insulators and then run a galvanised wire around the top – but electric fences are usually to keep predators out rather than chickens in… I would go for an extension in the height of the fence and clip one wing to make it more difficult for them to escape. Just use the black mesh on top of the fence that doesn’t have a firm landing area. They won’t land on something that sags. I keep it up with sticks and taped it with duct tape. Cheap too. 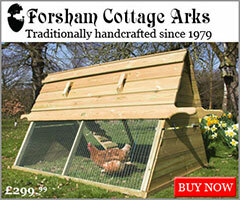 I lost my chickens this year to a fox which ripped open the electric fencing. This fencing was connected to the mains so the fox must have stood and just taken the shocks. I’ve had fencing for 5 years without any mishaps but now at a loss to know what to do. Foxes won’t do this. But.. they know when a fence is turned off or weak. Either the electric failed, the fence was shorted to ground so was not effective, or the fox found another way in. Can you test the fence with a tester? Some of the energisers are fairly weak and with a little vegetation shorting a wire out, will not work. I have flashing fence testers around the perimeter of my enclosures so I can check they are working when I lock up at dusk. 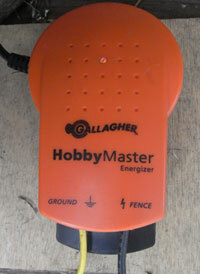 There are testers that you can buy to check the voltage on the fence. We used electric fencing and the fox simply jumped over the top and killed a drake. 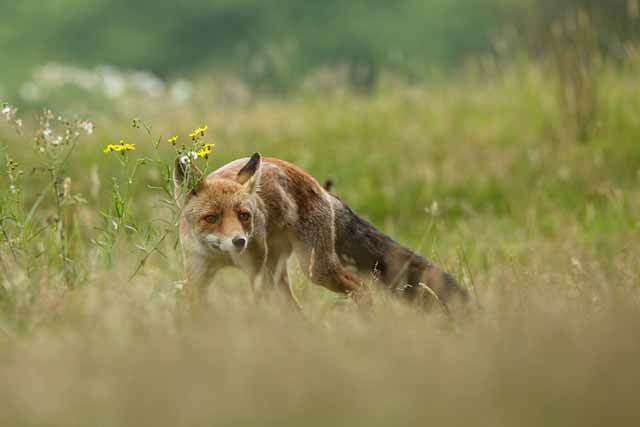 When it hopped back out, our only female: Moriarty, had her head stuck in the fencing So the fox finished her off from the outside with intentions of coming back later. This had been done within a two minute time period, as we had walked straight past to put the dogs away, before heading back up to put the ducks away. We have fox traps set out, but they do not work, so we are replacing the tripwire constantly in case they go rotten. To protect our only drake, we use Harris fencing (the kind outside building sites) which is cheap, strong, and tall and one-hundred percent fox proof. Simply dig it into the ground, plant flowers to make it look pretty and it protects anything. 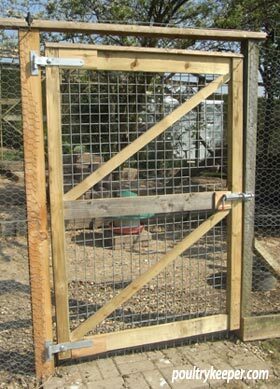 We are now hopeful in using this fencing to protect our new ducks, chickens and turkeys. Sorry to hear of your loss to the fox, I’ve used electric fences for years and never had trouble. I test it regularly to ensure it’s effective. I would add a single wire about 1ft off the ground (fox nose height) on plastic insulators about 2ft back from the fence. I’ve seen this used on waterfowl collections and gives the fox a better chance of touching it when he tries to get into position to jump. 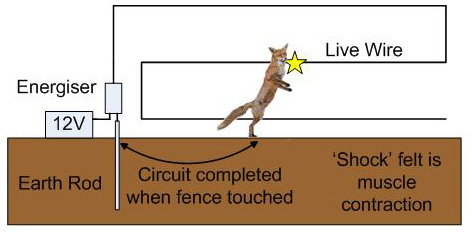 It is unusual for the fox to jump the fence without having touched it first. I would double check it’s working and there is an obvious wire close to the fox’s nose level, sticking out from the fence. For the fox trap – it needs to be fairly big and the bait needs to be good. If there is other food around, they won’t usually bother with it. Fish guts are great but bodies of the birds they left will also work. It can take weeks for them to build up enough courage to go inside. 4-5 weeks is not uncommon. Another successful method I’ve seen used (although it’s not so nice for the birds) is to put the back of the trap against a modified poultry shed door or pop hole. The fox thinks he can get inside the shed through the trap to get to the birds. If you install electric fencing correctly, the cat shouldn’t be able to get underneath it or climb it. 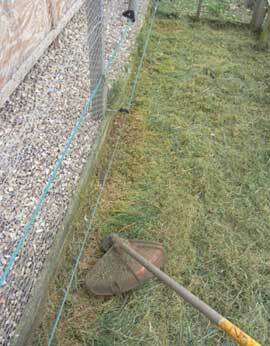 Just make sure the grass is kept short enough so as not to touch the bottom wire or rope. This was the most helpful explanation of electric fencing thanks. There are so many different things out there it’s hard to know what they all are. 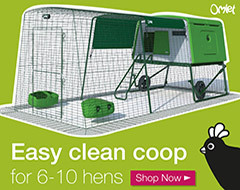 New to chickens- 20 rescue hens arriving soon! I’m pleased it helped. Thanks for the feedback, I appreciate it.